I can’t tell you what a privilege it is to be here. It’s beyond what I can easily express. The New Wine movement has done so much in our lives and in our family’s lives. God has worked through you in so many amazing ways, and so much in the church. What I’m hoping to do today is start by looking at some of the wider view that I have the privilege of getting to see a bit of around the world – not just in the church but more widely. And then to narrow it down and talk about some things that affect us, and particularly something about New Wine. And if you’ve got a Bible with you, you may find it helpful a bit later in the talk to look at 1 Corinthians 4: 1-13. We are living in a time of uncertainty. There’s nothing new about that, the world is always uncertain. But there is an economic and political uncertainty, I want to suggest now, that we have not seen since 1989 when the Berlin Wall fell – and then before that really since the 1930s and the rise of fascism, the rise of Communism, the depths of what Philip Bobbitt, in an amazing book called The Shield of Achilles, describes as ‘the long war’ from 1914 to 1989. Economically, many economists talk about us going into an age of secular stagnation in which there is little or no growth in the economy, in which inequality deepens and deepens. An age where society becomes less and less fair. Politically the consequences of that are always – and always have been throughout human history – profound instability. And we obviously face in Western Europe, in the global north and spreading through the web at an unparalleled rate, secularism: the acceptance that there are no absolutes – apart, of course, from the statement that there are no absolutes, which is an absolute. We are living in that and it will have huge, huge consequences for us. We are seeing powerful figures rise who claim to be the ones to make their nation great again. Trump that if you will [laughter]. But if you look at what is coming out of some of these figures… it is a desire to make the world certain, from their own point of view. And we know, you know, I know, there is only one certainty in the world and that is Jesus Christ. There is no one else who is certain. If we put our hope in princes or elections or whatever, we will be betrayed. It’s because people are human. It’s not a comment on politicians. The ones I have the blessing of meeting are in the vast majority people of great honour and integrity doing incredibly difficult jobs. But we know that they’re human. This context of a world of insecurity, of inequality – of all the other things we read about – is a context ideally made for the people of God. It’s the sea we swim best in. It’s a sea in which it’s for us to give, to suffer, to die, to convert, to transform. We are in a time of rough seas, for those who like windy weather. And if, like me, you grew up with sailing as part of what you did, the days of rough seas are exciting. We should not be intimidated. In John 6, when the disciples are in the middle of the rough sea and see Jesus coming to them over the water, his first words are: “Do not fear.” So do not fear, people of God: we are in a context ideally made for the people of God. This is not a time for safe hands and faint hearts. It is a time for courage and adventure, and living as the people we really are. Praise God for the responsibility of living in these times. And if we are God’s body, we embody the one who was and is and is to come. We have to be the people who, when we are seen from outside, people say, “That’s what Jesus is like.” Not as individuals but as the people together. and the future, the God who is to come. They need people, Christian communities, with memory – a sense of present reality and vision. Without those three perspectives we forget who we are and where we come from. We repeat the same mistake and we tell the same stories. Without a sense of a reality of the present, we lose the sense of what we truly are facing and we don’t engage with how life is. The Lord has been speaking to me over the last few weeks – particularly through the book of Revelation, which I’m studying in my own devotions at the moment – about this question: do we see correctly? Do we really see the world as it is, or do we see it with such strong glasses on of our own imagination that we see it the way we want to see it, not the way it is? And the future. If we don’t have a sense of the future we’ve nowhere to go and we’re directionless. So for New Wine, remember your past. This has been a shaping movement in the church in England and now around the world. Celebrate the many things there are to celebrate. It’s made many of us who we are. When you gather as New Wine leaders this should be a time of celebration, of unparalleled thanksgiving. But we’re not only called to celebrate the past. I heard something fascinating which many of you will know: more people die in the desert from drowning than from thirst. This is because when they get to a wadi, where water has flowed in the past, they set up camp in the bottom of the wadi, and when there’s a flash flood they get swept away. Let us not camp in the place of previously running waters. One of the most vital things for all of us who are of the Spirit is to keep alert and open to the new things that God is doing. And even those things are always consistent with whom we have known him to be, God very rarely simply repeats himself; he is far too imaginative for that. So look to the future. Have a big enough vision of the thing we’re part of. This is not about us – it’s about who we serve and what we enable: the Kingdom of God. Too much we collapse the future into the present. That is so dangerous in many ways, but not least because it gives us nothing to look forward to. New Wine is part of a movement serving the renewal of the church. How big is our vision? I want to say to you today that I believe from the bottom of my heart that the long years of winter in the church, especially in the Church of England, are changing. The ice is thawing, the spring is coming. There is a new spring in the church. I say to you secondly: embrace the present. With all the pain, the grace, the weakness and “we’re not what we hope to be”. For the Spirit always meets us in the reality of the present, to lead us into God’s future. There is no despair in the church because we serve the God who raised Jesus Christ from the dead. Let us not duck things or paper over difficulties. The Christian life is never served by fantasy. But let us conduct ourselves as people of the light, with integrity and honesty, not playing games, doing the right thing because it’s the right thing. There might be something here about not wishing we were somewhere else. Let us be where we are now. I sometimes look around in Lambeth Palace. If you’ve had a bad day, you’re walking down the corridors surrounded by pictures of your predecessors, all dead, and you can hear them sneering [laughter]. Because looking at the past both enchains us but it also inspires us. At Canterbury Cathedral there is a chapel at the west end that is especially complicated for me psychologically. It’s complicated because it has a list of all my predecessors, right back to Augustine. If you want to feel inadequate [laughter] then try looking at a list that begins with Augustine, rushes through St Dunstan, who reformed the life of the church, has five of your predecessors who were murdered, has St Anselm, one of the greatest scholars of that or any age, has Cranmer and many others, and ends with my name [laughter]. It looks like a bleat at the end of a series of trumpet calls [laughter]. But all of them left legacies behind them. All of us do and we remember, in the first few chapters of 1 Corinthians – and 1 Corinthians 4 is the culmination of 1 Corinthians 1-4, which picks up the extraordinary sense of dysfunctionality of the church in Corinth. In 1 Corinthians 3, Paul speaks of some people leaving legacies built with lasting materials, others with straw. I wonder what thought you give to your legacy, to what you will leave behind – to how you might be remembered; most of all to how we will all be judged. That’s the hardest issue for me, in the decisions of daily life, in how I live each day, how I pray, love, argue, decide, discipline. It’s very difficult for me to escape – especially difficult to escape that sense of our legacy, of what it could be and what it shouldn’t be. When I’m in Canterbury I walk past those memorials and I go through a door leading me to the steps on which the blood of Thomas Becket fell in 1170 as he was killed by the King’s knights. I walk past that memorial of him and I often stop and pray there, because it makes me reflect on sacrifice, obedience, faithfulness and being so trusting of God and what comes next that you are prepared to give your life. Every year on 29th December – the anniversary of Becket’s death – at the cathedral in evensong there’s a re-enactment of what happened, because it was during vespers (as it was called then) that he was killed. Whoever is the current Archbishop of Canterbury stands in the place where he was killed. It’s a slightly odd feeling [laughter]. T.S. Eliot wrote a wonderful play called Murder in the Cathedral about it. In the play four tempters come to Becket – the first offers physical safety, the second riches and fame, the third power. They are all real temptations for us. But it’s the fourth temptation I want to focus on. In Eliot’s play he put it like this, he puts these words in the mouth of Becket: “The fourth temptation is the greatest treason: to do the right thing for the wrong reason.” This temptation to Beckett is around his legacy – to get what he wants, what he thinks is right, but in the wrong way. We can do the wrong thing for the right reason, and we can do the right thing in such a wrong way that it becomes the wrong thing. Unlike politics, in the church, the ends never justify the means, because the ends are not ours – they are in the hands of the Lord Jesus Christ. Therefore the ends never justify the means. When we look back over Christian history we see this. As Augustine lay dying in Hippo in the early 6th century, a city besieged as the Roman Empire fell around him, was that a moment of disaster? No, because God raised Jesus Christ from the dead, and he raised up Benedict at that very moment and they saved civilisation through the Benedictine monasteries and they kept the gospel alive. And here we are today. Our view is not the same as God’s. His ways are not our ways. When we put our means to his ends, we lose sight of his ends. However when I read scripture I see a different standard of the followers of the way. The evidence seems to be that some people that the commentators call the super-apostles, people who boosted themselves, have followed him in and questioned everything he stood for. They have raised suspicion about his credentials and about the power of his ministry – and he sees everything that he had built in that church going up in smoke. Much of 1 Corinthians and 2 Corinthians seems to be an attempt by Paul to re-establish his authority. But the way he goes about it, to bring them back to being what they should be, is extraordinary. Because he does what he always does – he refuses to make himself the subject of the ministry. He never says: “Be loyal to me.” Whether it is ministry, judgement, affiliation or gifts, the main player in his talking is not Paul. It is God – Father, Son and Holy Spirit. This is not about him – it is about God. Our biggest mistake is to confuse church politics talk for God talk. One of the most influential afternoons I’ve ever spent was with a man called Van Thuan, a Roman Catholic cardinal who had been in prison in Vietnam for 14 years. He was tortured, and led his torturers to Christ. And the guy who is my spiritual director, another Roman Catholic priest, a monk, called Nicolas Buttet and I just listened to their conversation for the afternoon. I didn’t say much. And all they talked about was how wonderful God was. They just talked about Jesus. They didn’t talk about the church, they didn’t talk about how bad the bishop was, they didn’t talk about anything except prayer and Jesus. And I can’t tell you, you felt that the end of that conversation you had been bathed in light, because your whole soul was being cleaned by hearing two people obsessed with the person of Jesus Christ. He has drawn us into sharing the revelation of those mysteries in our lives that are of him, together as God’s people. There’s much talk in our time, in these months, in England and Britain especially, about nations and sovereignty, and there will be many views about that here. But one thing we have in common, whatever our class or nationality or views on Brexit, is that we are participants in God’s Kingdom – equal, undivided, we all belong together. Sharers as stewards and servants of his mysteries. In verse 7 of 1 Corinthians 4, that incredible verse, Paul says to them: “What do you have that you did not receive?” And so, what are you boasting about? Everything is grace. Everything is gift. Nothing is earnt. Nothing is reward. Nothing is our right or our due. In fact we absolutely, praise God, don’t get what we deserve. For we get everything. God’s way is one of extravagant and unconscionable forgiveness. Inexcusable forgiveness, were it not that he is God. Paul knows he is writing to a church where judgment is rife – but he says he cares very little for human judgement, for it is the Lord who judges. There is a strong tradition which traces the root of our sinfulness to our desire to be judges over others. You will remember in Genesis 3 the temptation to the first humans was to eat the fruit, because in doing so they ‘would be like God…’. Sin is to set ourselves upon the judgment seat of God – not where he will set us but to set ourselves, thereby declaring others to be guilty and ourselves to be innocent. Paul believes in judgement, of course he does – quite right, so do we – when everything in darkness will be brought into light. In the future Jesus Christ’s return and reign are certain – this is determined by the past – his death and resurrection make that certain future. And all human actions fail, all human judgements are lost in the light of that final judgement. It will be a judgement in the light of Golgotha – where the judge is judged in our place. Here we are judged, on the cross. That’s our judgement and we are found guilty – and he takes our place. Everything that happened to me, everything that happens to you, is caught up in that moment of judgement. Here something is made possible that seemed contrary to every possibility. The great exchange. And we are innocent before God. Here is the mystery: we are forgiven and loved. I still find in myself, and in almost every Christian I meet, that they cannot quite believe that they are loved by God and forgiven – entirely, unconscionably, unfairly, inspiringly. David Ford, the great theologian, retired Professor at Cambridge, in a wonderful book of the densest theology, suddenly, when talking about one aspect of the love of God, bursts out, in a sort of bracket: ‘But who cannot be overwhelmed by the love of God?’ Well the answer is an awful lot of us. If I pray one thing for you, and for me, it’s that we find constantly afresh that we are overwhelmed by the love of God. So, one judgement. Let’s recapture the fact that it has been done, we will be judged but the verdict is past. If being in Christ is the primary thing, who we are is defined in reference to that. Verse 1 of 1 Corinthians 4: ‘We are servants of Christ’, ‘Stewards of the mysteries’, ‘Fools for Christ’. We are called to be servants. At the meeting of Anglican Primates in Canterbury in January, we had Jean Vanier from the L’Arche communities. These are wonderful religious communities in which people with learning difficulties and extreme disabilities live with people without. They live as equals, and they serve each other, they minister to each other. They are the most beautiful places, many of you will know them. Jean came and he spoke to the thirty-six Archbishops. He spoke from John 13, the washing of the feet, and then he said: “Right, now we’re going to wash feet.” So we washed each other’s feet at the end of a week not of temper but of deep, deep struggle – and the tears poured down people’s faces. Because when someone kneels in front of you and washes your feet, and you are called to pray for them at the end, and it’s been completely randomly selected, and you may have disagreed with them all week, but together you are humbled before the face of Christ. We are servants of Christ. Washers of feet, not lovers of publicity. We are his servants. And because we are servants and stewards our task is to be faithful. Not to give thought to our legacy, apart from asking: are we bearing faithful witness to Jesus Christ? But do you know, may I tell you a secret? We’ve had a strong leader for 2000 years, and today we still have him and he’s called Jesus Christ. We don’t need any others. He’s actually quite sufficient. And by the grace of God he equips the most marvellous leaders. God will supply those for us. Our call is not a quest for great leaders, but a quest to be a holy people. For that is the only way that we win a world more and more lost. What Paul means by all of that we can unpack in many ways, but I want to pick three things. Firstly, transparent lives. Are we who we say we are? We do not wear masks or hold up facades. Are we honest about our failings and candid about our weaknesses? We must be genuine and true. I remember giving a talk at a cathedral a couple of years ago and I said, quite routinely, “We’re all sinners. I’m a sinner exactly like everyone else here.” Someone came up to me very cross afterwards and said: “If I’d known you were a sinner I wouldn’t have come.” [laughter]. Secondly, a life that is lived in the light prizes holiness as the most powerful, engaging witness that was so attractive in Jesus. Yet far from sending sinners away, it drew them in. The people it repelled were those who thought themselves holy. Years ago Caroline and I were involved in Bible smuggling in Eastern Europe, before the fall of the wall, when we were just married. We went to one woman’s home in Romania, she’d been persecuted, hounded. She was watched. We met with her secretly. From the moment we met her, you sensed you were in the presence of Christ. Nobody’s ever heard of her, but when we get to heaven she’s going to be a lot closer to the throne than I am. You just saw this holiness, this love, this uncaringness about her own future fate. Holiness is about genuine participation in Christ. And as leaders it means humility. It means not being those who want to dominate at all times. It means being washers of feet. We have this quasi-monastic community at Lambeth called the Community of St Anselm. The people who help us lead it are a Roman Catholic monastic community called Chemin Neuf, which translates as ‘New way, new road’. One of the sisters there is someone who just constantly leads people to Christ, because she is someone of holiness and godliness, and they find her irresistibly attractive – not herself, but the person whom she loves so much. So, humility. We handle conflict in faith. For Paul holiness meant blessing when he is cursed; when slandered, he answers kindly. He does not resort to trickery. He builds the church. He exposes sin, but he does not bring division. Please may we ditch that old ridiculous dichotomy that somehow truth and unity are opposed? You can’t have truth without unity – Jesus said that (John 17). And you can’t have unity without truth, because what are you united on? They are hand in glove. And, thirdly, for leaders: a remorseless focus on Jesus, which is the only antidote to sin. I was reading this morning an email that came to me from a wonderful Coptic Orthodox, Bishop Angaelos, he’s Head of the Coptic Orthodox in this country, giving a talk yesterday about leadership. Twenty-one Coptic Christians were murdered a year ago on the beach in Libya. Bishop Angaelos said: “We need to be hope in an increasing hopelessness, and light in an increasing darkness. It is not enough for us only to lead in good times: good leadership is especially required at the most difficult of times. Not only is it required, it is essential because it is at those difficult times that people look to a beacon and they look to someone to follow.” And we need generosity of spirit. Lastly, we need willingness to suffer. Paul is having none of that over-realised eschatology which suggests the people of God should be living as if the Kingdom had come in full. He talks about being weak, hungry, thirsty, in rags, brutally treated, homeless, working hard and persecuted. That’s why the super apostles despised him. In Murder in the Cathedral, as the knights arrive, the contemporary records Eliot drew on said that the monks called out, “Bar the doors. Bar the doors. We will protect our Archbishop.” Becket cried out: “Unbar the doors, unbar the doors. The church will protect its own in its own way.” That way was to accept suffering and loss. The ice is breaking, the spring is coming. 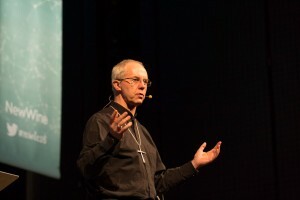 At the Church of England’s General Synod last month we had a half day spent entirely considering witness and evangelism. We are church planting in every diocese. My dream is that there should be a major resource church in every diocese in England, working deeply with all the other people of God. The Church of England is not priority or privileged. We’re finding, I’m finding, now that people are pushing for change, rather than those who want change having to pull against the status quo. New Wine have been heroes and will continue to be. You’ve borne the burden, you’ve turned the tide. There is renewal and life springing up. Now there must be a new spirit that does not look back but forward. That looks for the new things that God is doing. That preaches the gospel afresh in this generation. That is not afraid nor ashamed. We may be dispirited when leaders fail – and all leaders fail – but Christ is their merciful redeemer, and mine and yours, and they are loved profoundly as are we all. None of us may judge. And the God who raised Jesus from the dead will not abandon his church. This year, between Easter and Pentecost, the Archbishop of York and I are calling for a week of prayer for evangelism in this land. Will you join me in that? Will you give yourselves for that week to praying for people to come to Christ? Because that takes me back to the beginning. What is our legacy? Who knows and who cares. All that concerns us is Jesus Christ, for we are his legacy and are living lives that would make no sense were it not for him. For he is completely true, completely faithful, completely trustworthy. He simply asks us, his servants, to live in a way that witnesses to him in this world.